BLOX is proud to introduce its next generation billet lower control arm. 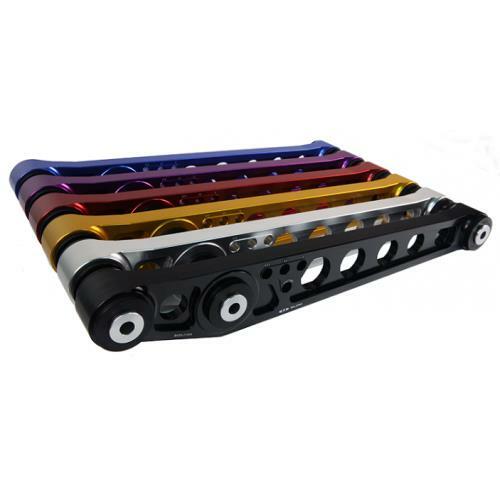 These rear LCAs feature a fresh, machined design and are manufactured out of high-quality billet aluminum. Being introduced first will be lower control arms with polyurethane bushings featuring six show-quality finishes. Future additions will include raw-aluminum. The next release will also feature spherical bearings. In addition, both polyurethane bushings and spherical bearings will be available as replacements and for upgrades. The unique feature of the new design allows bushings and bearings to be interchangeable on to the same arm.